From research I understand it takes place each year usually between March 20th and mid-April and Shan boys between seven and fourteen years of age participate, at some point. Not only are the boy’s proud parents and relatives involved in the excitement but visitors from other parts of Thailand come to see and photograph the spectacle. Having witnessed this event myself while living here I thought it might be nice to share a story about this extremely intriguing festival that is now taking place. It is also an example of cultural diversity in northern Thailand. Thanks to a friend for his pictures of this year’s ceremony at Wat Ku Tao in Chiang Mai. 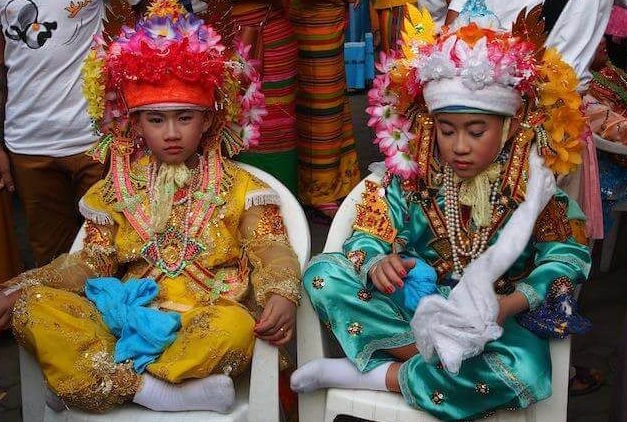 It occurs throughout most northern Thailand towns where there is a Shan community and these young boys participate in the traditional ceremonies that are bright with color and Thai Yai culture. 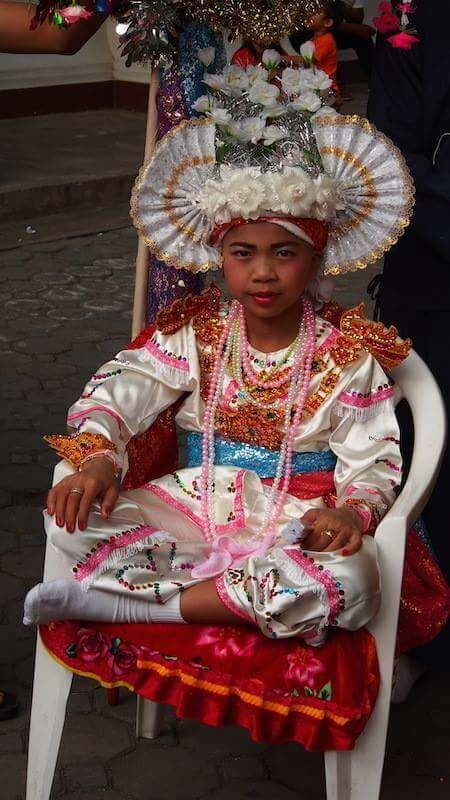 The Shan people – ancestrally known as Thai Yai, are close cousins of the Thai people, which is not surprising as country boundaries were extremely fluid in former historical times. 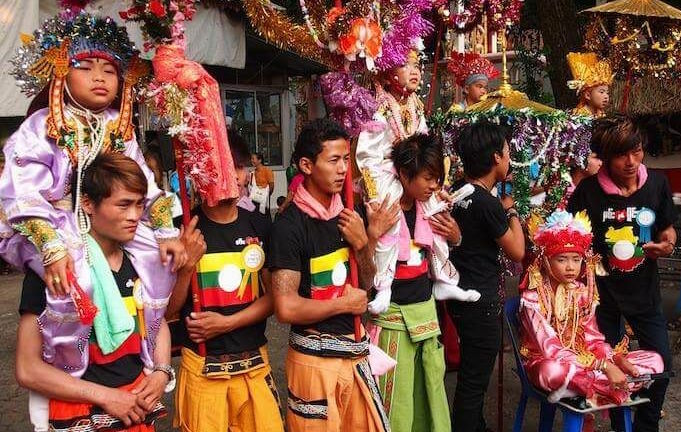 The festival of Poy Sang Long is essentially Thai Yai (as are the words in proper Thai – it is called Buad Loog Gaew) and means “ordaining the beloved sons”. The Thai Yai, like their full-Thai cousins, are devout Buddhists who annually present young sons to be ordained as novices. 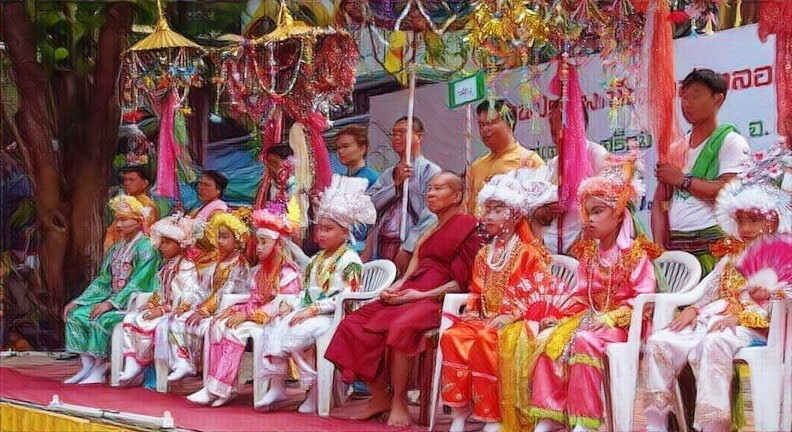 The boys, and their parents, earn merit from this act of devotion while the boys also learn the tenets of Buddhist teaching and the self-discipline required of a monk. What is this cultural festival? It consists of taking novice monastic vows and participating in monastery life for a period of time that can vary from a week to many months or more. Usually, a large group of boys are ordained as sāmaṇera (novitiate monk) at the same time. In Thailand, where Shan immigrants have brought over the traditions from Myanmar, the ceremony goes on for three days, as the boys (dressed like prince in imitation of Gautama Buddha, (who was himself a prince before setting out on the religious path) spend the entire time being carried around on the shoulders of their older male relatives. On the first day – the young participants are the focus of family feasting and gift giving before the boys are escorted to the temple to have their eyebrows and heads shaved and be ritually cleansed and anointed by bathing in sacred lustral water. The parade to the temple is accompanied by the shrill of flutes, the beat of drums and the clash of cymbals as local musicians give their support and respect to the boys. On the second day – now shorn of his head of fine black hair, the young boy wears a snow-white turban and is again the center of family feasting and dancing. Once more he will parade to the temple, with his dancing and drumming entourage, to offer gifts to Lord Buddha and the resident monks. A horse is usually featured in this parade as it symbolizes the vehicle on which rides the community Inthakin Pillar (fertility totem). During the evening, prayers for guidance and blessings from the “spirits” will be intoned and recitations, reminding the boys of the following day’s full ordination, will be said. 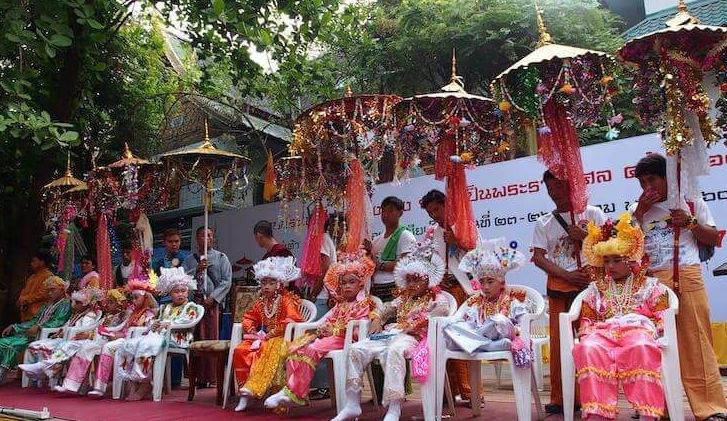 Celebration will also take place that includes musical performance of dancing, singing, and merriment..
On the third day – the day of ordination, each boy will be transformed into a “Jewelled Prince” (“Loog Gaew” in Thai). His face will have a cosmetic makeover with powder, rouge and lipstick and then he will be dressed in glistening, sequined finery of every hue. On his head will be the white turban haloed with fresh flower blossoms. Today, the boy is carried aloft on his own personal throne to the temple, surrounded by his family and well-wishers with his ears ringing from the strident clash of Shan music. Although he is only young the boy is said to handle the parade with all the panache, aloofness and dignity of a “Jewelled Prince”. It is magical to see this young figure, composed in expression but bright with color and glitter, as he progresses to the temple. Once inside the temple, each boy will ask the Abbott for permission to be ordained. 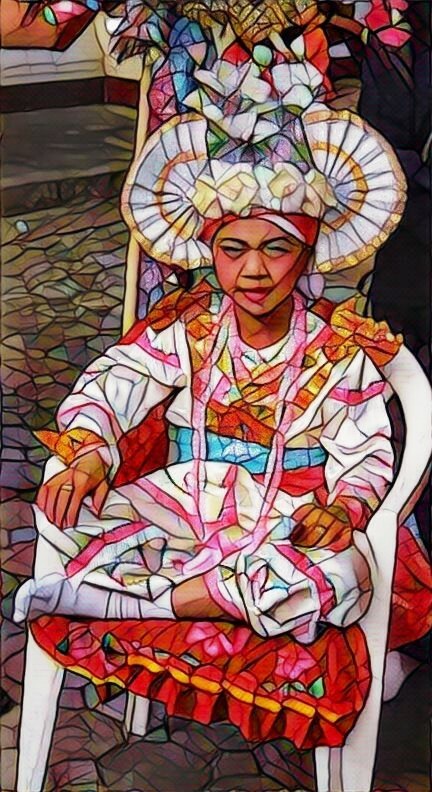 With permission granted, the boy will take vows and then divest himself of his colorful finery in exchange for the humble saffron robes of a Buddhist novice. Here, in the temple, the boy novice will remain for his allotted time. During this time he will follow the routines of temple life, learning from and watching his elders as he absorbs the essential foundations for a responsible and rewarding adulthood. During Poy Sang Long there is also the ceremony of Jaang Long that will take place. This is a ceremony for a mature novice of 20 years old who went through Poy Sang Long in the past and have chosen to be ordained as a monk today. This is another example of what makes Thailand a most interesting and enjoyable place to experience and writing about it helps to clarify and understand the culture for myself. (1) I want to acknowledge Wikipedia, the free encyclopedia, as a source for some of this content and my Facebook friend Franz for his pictures.